Ever wondered how to heat gun? I wrote some tips and a tutorial for you below. "It's no delay to stop to edge the tool"
Have you been a little intimidated about using a heat gun? 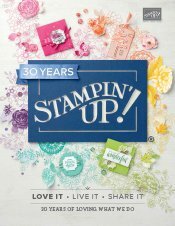 Let me help you understand a little more about this useful tool and maybe you will want to add one of them to your craft supplies or break it out a little more often if you already own one. Heat guns are pretty much essential tools for papercrafters. They are slim tools that are built with the safety features of a hair dryer, having a safe plastic body to hang on to and a nozzle for directing the super hot air. They remind me of the shape of an electric drill tool or a straight hair dryer. Incidentally, you can buy a Heat Tool from me if you live in Australia by going to SusanSalutations. It is listed as being a heat tool on the site. Basically, if you can use a hair dryer then you can use one of these craft tools. The temperature generated by the tool is higher than that of a hair dryer though so please don't try drying off the family dog with it after you have bathed him or accidentally directing it at someone's face or eyes. Having a nice, hot, dry stream of air to focus on your papercraft projects can be extremely useful at times. 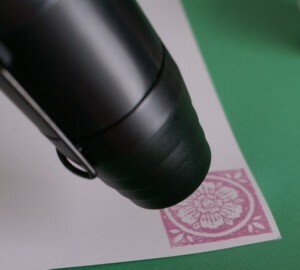 The most common way to use a heat gun is probably for heat embossing. This technique is one of my favourites, as I am sure you have discovered from browsing this site. First, plug it in and if it has a stand, set it on that by folding it out from the main body of the tool. Next, prepare your papercraft project to the point where you need to melt or dry something out. Now pick up the heat gun and turn it on, pointing it toward the ceiling or away from your project. Allow it to run for a few seconds so it is properly heated up. When it is hot, hold your papercraft project securely in place with tweezers or a wooden stick or similar and bring the hot stream of air onto your project. 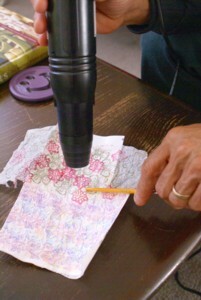 Hold the heat gun more than 2cms (1") from the object you want heated and move it slowly over the surface of the item. Sometimes you can hold the tool further away and get a wider scope of air across more of your project. When you have achieved the effect you want, turn off the heat gun and replace it on its stand. Turn off the power source and unplug the gun. Safety Note: It will stay hot for a little while so don't burn yourself. You're done! Now you know how to heat gun!